Here’s a post from Father Z’s blog that should be read by every Catholic contemplating marriage. It covers a particular scenario, but the principals apply to all marriages. For some reason, otherwise reasonable Catholics seem to want to throw their faith out the window when it comes to marriage. It’s a short post. Check it out. This last statement, which ended last week’s Gospel is repeated today. I guess it must be important. 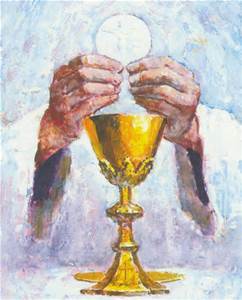 As Catholics, we have the privilege of receiving Jesus’ Flesh and Blood at every mass in the form of the Eucharist. In just a few minutes, we’ll all be allowed to participate in this heavenly meal. Today we see that the Jews quarreled among themselves about this. “How can this man give us his flesh to eat?” That’s where they got it wrong. While Jesus is a man, He’s also the Son of God. He goes on to explain how this can be, but they still don’t get it. In fact, they don’t get it even today. They’re not alone. Many of our protestant brothers and sisters don’t get it either. Sadly, there are even Catholics who don’t understand how Jesus could give us his Body and Blood to eat and drink. Polls tell us the fastest growing “religious” group in America is “former Catholics”. I think that’s very sad and very confusing. How can anyone who understands what we’re receiving in the Eucharist ever just walk away? It’s the greatest gift in the history of the world. Jesus Christ, the Son of the Living God, allows us to take His very Body and Blood into our sinful bodies. No God was ever so generous! Yet so many of us take this gift for granted and are even willing to leave the Church either to spend our time on earthly things like sleeping in, or golf, or whatever we think is more important. Or worse, many leave the Catholic Church in favor of some other church where they offer a more entertaining service. High tech audio video, up-tempo music, or a watered-down message can never take the place of Jesus’ real presence. It’s not always easy to be Catholic. We have rules. We stand for the truth, even when it’s not popular. We take Jesus’ command to take up our crosses seriously. But the reward is so great. Those of us who receive the Eucharist today, both here at Saint John’s and at thousands of Catholic churches around the world, will leave with Jesus’ life within us. Nothing can be better than that! Some say that Jesus wasn’t speaking literally when He said we have to eat His Flesh and drink His Blood. The Jews argue about it in today’s Gospel. In next week’s Gospel we’ll see that many of His followers left Him because of this teaching. But He didn’t do that. He let them go and He lets them go still today. The Eucharist is the core teaching of our faith; always has been and always will be. Everything else we do is directed to this one simple truth. We have seven sacraments. Most of them we’ll only receive once in our lives. But the Eucharist, and the sacrament of reconciliation, which goes along with it, are available to us whenever we want them. Every minute of every day there is a mass going on somewhere and if you’re not in a state of mortal sin, you’re welcome to receive Christ’s Body and Blood at any of them. In the last month, I’ve received the Eucharist in Canada, in Alaska, in Alabama, and on a cruise ship. And, you know what? Every one of those masses was almost exactly the same. Jesus has given us this great gift and made it readily available. Over the centuries, loyal Catholics have fought and died for the Eucharist. Yet, today, people who call themselves “Catholic” can’t even be bothered to show up once a week. Like I said, many of them even leave the Church, giving up this great gift. But, you know what? If they decide to come back, Jesus welcomes them back with open arms. Go to confession, and it’s like you never left. Frankly, I don’t understand it. We use the phrase “Sunday obligation”, which I personally hate, to describe our need to attend mass weekly. How can we refer to receiving our Saviour’s Body and Blood as an obligation? If we reflect and pray on these Gospels, wild horses shouldn’t be able to keep us away. Like He said, “Whoever eats this bread will live forever.” I think that’s worth the effort, don’t you?